Morton® Packaged Kiln Dried Feed Mixing Solar Salt is manufactured from domestically produced solar salt and is specifically designed for the needs of feed mixing. 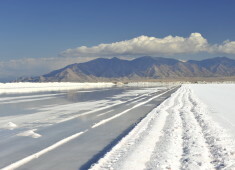 The salt is produced from brine impounded in open shallow ponds where it is concentrated and ultimately crystallized through slow evaporation by solar heat and wind. It is dried and screened to a fine screening standard. This salt contains no additives and is intended for livestock feeding.